or : Use the joystick or console control pad to direct the movements of Bubblun and Bobblun. Press left or right to make the boys run in either direction. Up or down have no use in-game; although depending upon the system, they may be used to navigate menu selections. (Rainbow): Press the first action button to create a rainbow in front of you. The speed of creation, as well as the number of rainbows created, can be improved by collecting items throughout the game. (Jump): Press the second action button to jump up. Jumping can be performed in conjunction with moving. The longer you hold the jump button down, the higher you will jump. Note that it is possible to jump on top of rainbows without dropping them by holding the jump button down. Meet Bubblin and Bobblun, the two brothers which players control throughout their exploration of the Rainbow Islands. Bubblun and Bobblun have two special abilities that set them apart: they can jump very high, and they can create rainbows. 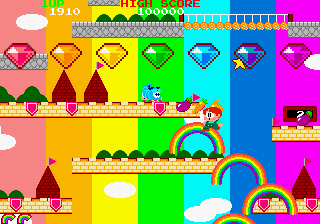 The rainbows that they create are capable of crushing enemies while they're being created, or when they are falling to the bottom of the screen. Once created, rainbows can be used as weapons or as platforms. To use them as weapons, Bubblun or Bobblun must jump on top of the rainbows, or jump up through them from below. This will cause the rainbows to fall, catching vegetables and items as they fall, and potentially killing enemies. To use rainbows as platforms, simply walk over them. From the tops of the rainbows, you can jump higher, or create more rainbows to walk across. Players advance to the next stage by reaching the very top of the current stage. Bubblun and Bobblun are vulnerable to the touch of the various enemies and the projectiles that some of them fire. They lose one life every time they are hit. The game is over when all of their lives are lost. Extra lives are granted throughout the game at regular point intervals and through other means. The boys can safely collect the various items that appear throughout the stages by touching them. Some bestow various powers and bonuses. When you begin the game, you start out with the ability to create one rainbow at regular speed. As you play, you may obtain power ups that increase the speed at which you can create rainbows, and even the number of rainbows that you create each time. Using the rainbows to attack your enemies takes some practice to perfect. The first and easiest way to attack with a rainbow is to create one and crush an enemy in your rainbow's path. Killing an enemy in this manner produces a regular vegetable or special item from every third enemy. The second method of attacking with rainbows involves crushing the enemies by dropping rainbows on top of them. Once created, a rainbow will hover in the air for a temporary period of time. During that time, it is possible to jump on top of the rainbow, or up through the rainbow and cause it to fall to the bottom of the screen. Any enemy that it strikes along the way will be killed. Enemies that are destroyed in this manner produce small diamonds instead of vegetables. Small diamonds are the key to unlocking some of the game's bigger mysteries. It should be noted that a rainbow does not have to start above an enemy in order to crush them. The game also allows you to create a rainbow just beneath an enemy. As long as it is close enough to the enemy when you drop the rainbow, you will get credit for crushing the enemy. This can sometimes be a safer method of obtaining diamonds. Not a real screenshot. This shows the layout of the seven color columns. Diamonds come in seven different colors, corresponding to the colors of the rainbow. When you crush an enemy with a falling rainbow, the color diamond that appears is determined by the location of where the defeated enemy lands (not by the location where the enemy was crushed.) The screen is broken up into seven columns, as shown in the illustration to the right. From left to right, they are red, orange, yellow, green, blue, indigo, and violet. For example, if a defeated enemy lands on the far left side of the screen, a red diamond will appear. If the defeated enemy lands in the very center of the screen, the diamond will be green. In order to collect one small diamond of every color, it is necessary to destroy enemies so that at least one lands in each of the seven columns on the screen. It should be noted that defeated enemies tend to travel the length of one column while flying through the air (the exception being those who bounce off the side of the screen.) Therefore, in order to collect a small diamond of a particular color, you should attack the enemy while it is standing one column away from where you would like it to land. Obtain all seven giant diamonds from the bosses of every island. Obtain each of the seven small diamonds precisely in color order (either from red to violet, or from violet to red). See the Special items page for more information about collecting the diamonds in color order. This page was last edited on 13 November 2013, at 04:38.